Plastic litter box scoop with long handle. 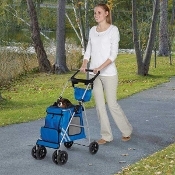 Portable pet stroller that folds up and down. Plenty of ventilation from all sides through the mesh windows. 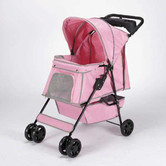 This stroller features swivel wheels and two cup holders. Mesh siding for plenty of ventilation and a view your pet will love. This stroller holds up to 25 pounds. Portable stroller that folds up and down easily. All mesh siding for plenty of ventilation and a view your pet will love.